From a very young age, American children have actions to take in emergency situations ingrained in their minds, and that crisis management education can be summed up in a short phrase: “call 9-1-1”. In doing so, the appropriate people will be alerted to the issue, informed of the caller’s location, and able to eliminate the risk in question and restore the caller’s safety. Need for supplemental support has been largely unacknowledged or ignored as confidence in the 911 system has historically been widespread. Recently, the efficacy of tried-and-true steps to take during an emergency have been called into question. While calling 911 when needed is never the wrong action to take, there are undeniable imperfections within the system that can sometimes prove fatal. Determining the caller’s location has proved a difficult task for 911 call-takers, and one that is prone to failure. Protocol for 911 operators begins with getting information on the caller’s location directly from the caller themselves, relying primarily on a verbal account of where they are. Especially in emergency situations, callers can be under emotional or physical distress or are situationally unable to speak at length. Too often, this results in a lack of sufficient information, gained strictly from the conversation, to locate the caller. In these cases, 911 call-takers then turn to clues that can be parsed from the caller’s phone, but an outdated model can give them trouble in an increasingly mobile world. 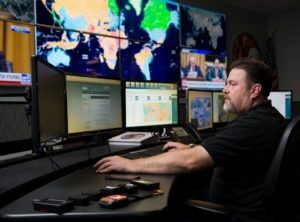 The 911 response system was built for receiving calls from landline phones, which relies largely on data from towers and copper wires to provide the information needed to dispatch officers to a given location. Although a resident’s name, address, and call-back number can be obtained from a landline call, only around 30 percent of calls to 911 originate from landlines. Cell phone calls do send an approximate location to the call-taker’s screen, but to narrow that radius down, the call-taker must request a location ping directly from the phone carrier, which can take minutes that are precious in an emergency. Particularly in urban settings, having only an estimated location leaves the operator overwhelmed with potential targets and unable to proceed with dispatching officers to the scene. In a world crowded with food delivery apps and ride-sharing services whose business models depend on accurate cell phone location services, it’s unfathomable that government emergency services could be in the dark about where a caller is located when they need help the most, but obsolete technology is to blame. Technology used in the 911 system is out of step with technology in the field, and most local departments are in dire need of extensive upgrades. The crux of the issue is that while 911 should be your first dial in an urgent situation, location information accessible to 911 services is not a guarantee. Because of this, enlisting additional risk management services is essential for the modern civilian. 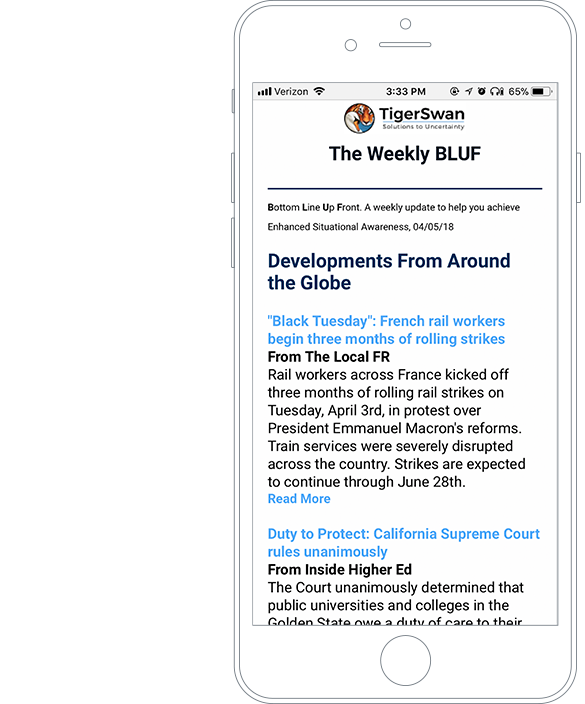 TigerSwan’s GuardianAngel Mobile App accounts for imperfections in the 911 system and ensures the safety and well-being of all of its users. 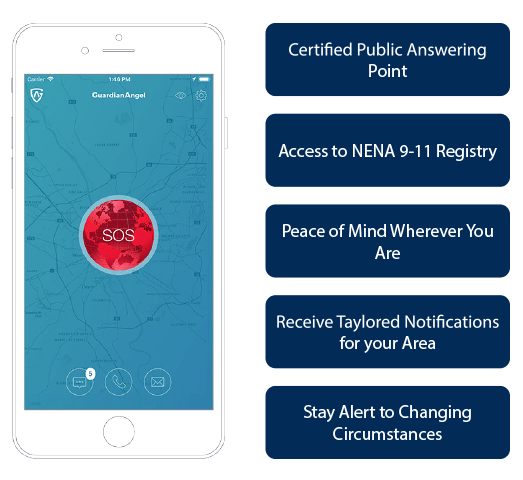 With a GuardianAngel membership, discreet location monitoring allows, at the push of the SOS alarm, for real-time location information to be seamlessly relayed to the appropriate authorities for immediate action. No guesswork or communication with wireless carriers is required, saving time vital to getting local authorities to you quickly. 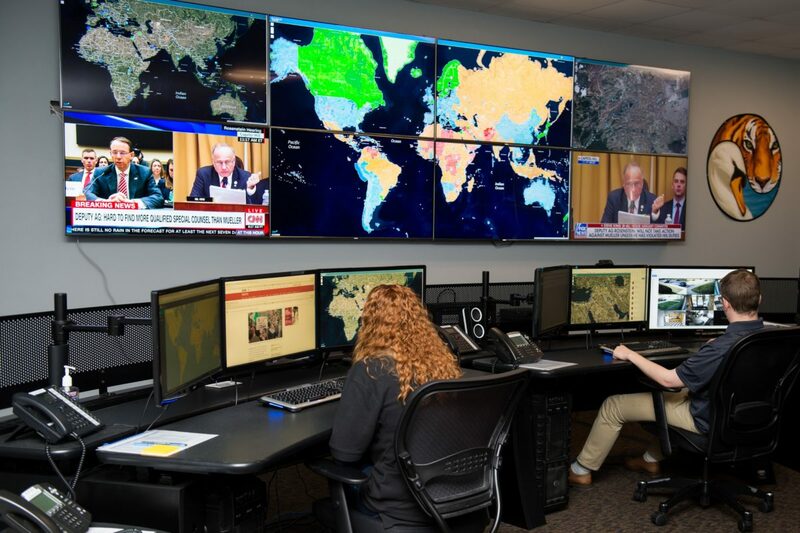 TigerSwan’s Global Security Operations Center (GSOC), the first point of contact between a user in crisis and local emergency services, is manned by veteran military special operations personnel and former law enforcement crisis management experts who are experienced at resolving security issues quickly and calmly. Users can choose to allow GuardianAngel services to run continuously in the background of their phone or withhold their location in incognito mode until the SOS alarm is used, providing privacy flexibility for users. The need for security information and assistance is not limited to emergency situations, and TigerSwan recognizes that with an offering of day-to-day tools to optimize proactive awareness among its users. GuardianAngel features push notifications alerting users to localized and national developments, from protests to changes in airport security measures, to keep its customers informed of their surroundings and less likely to encounter threatening situations. In the event that a user feels they require any kind of assistance or guidance, whether it pertains directly to an emergency or to a more minor incident, they should feel comfortable contacting the GuardianAngel team. Our GSOC Watch Officers offer 24/7/365 support and can be contacted easily through the app to help a user safely navigate any kind of uncertain or risky situation. An increasingly technologically-advanced world calls for all of its participants to step up to new challenges and work towards more efficient and innovative ways of problem-solving. For us at TigerSwan, that means providing life-saving help whenever necessary and regardless of situational obstacles. Never let fear or uncertainty keep you from all that the global arena has to offer, just know that an emergency technology fit for the 21st century is just a download away with GuardianAngel.